Over 60% of companies have started an Industrial Transformation (IX) program, or plan to start one in the next 12 months. This has led to a surge in MOM solution deployment. Software solution selection is a complex undertaking that demands multi-level, multi-regional, cross-functional, and inter-departmental collaboration. 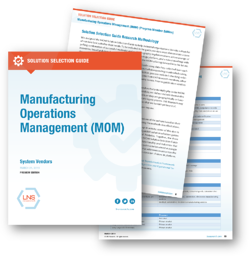 Manufacturers should not view Manufacturing Operations Management (MOM) as a simple point solution aimed at a single plant. Instead, MOM should fit into a larger Operational Architecture that addresses issues across the manufacturing enterprise. Today, there are two closely related yet distinct drivers for MOM implementation: the need to implement MOM as part of an IX program, and the desire to integrate the plant with business systems. This is a preview edition of the MOM Solution Selection Guide. Program members have access to the full text as part of their membership. If you would like to learn more, contact LNS Research to become a program member.